Your high school can make a difference. During the week of September 29, 2018, your high school can join hundreds of colleges and universities around the country. 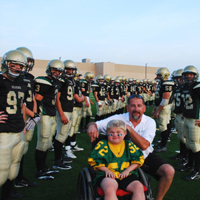 A partnership between the AFCA (American Football Coaches Association) and Parent Project Muscular Dystrophy to raise awareness and money for research for Duchenne muscular dystrophy. Duchenne is the most lethal, genetic disorder of childhood. It robs boys of their muscles, their strength, and ultimately their lives. But by joining our team, you can help us end Duchenne. 2. Establish a location to accept donations for Coach to Cure MD, such as a ticket booth, concession stand, etc. Be creative! 3. When you register, we would be happy to provide you with a fundraising kit with Coach To Cure promotional materials. Download the Coach to Cure MD High School Kit (PDF) for information to get your high school more involved. It's that easy...and so important! If you have any questions or need more information, please contact Danielle Garrigan at Danielle@CoachToCureMD.org.